The kids got an inflatable ball pit at their birthday party a couple of week ago. The girls have turned it into a hammock by flipping it over. 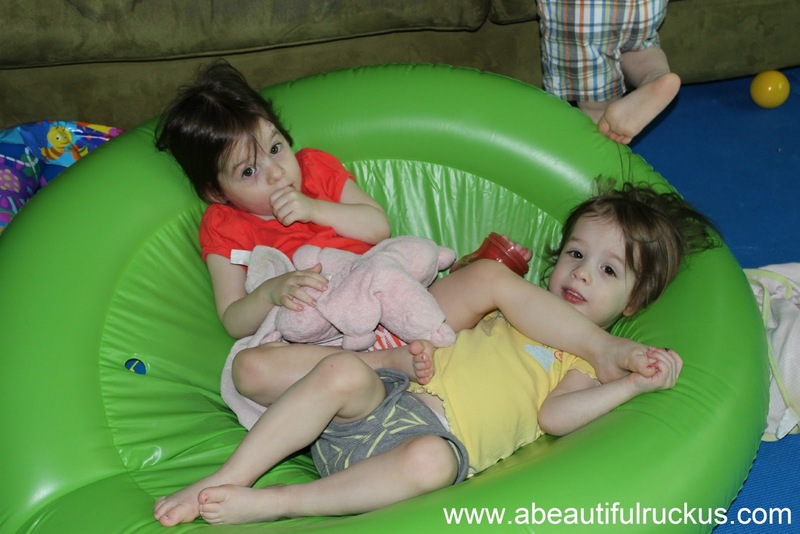 They like to climb into it and watch movies together. I've even found Ellie asleep in it a couple of times! 2. Standing in the Kitchen...Literally. I don't even know how she got in there...?? 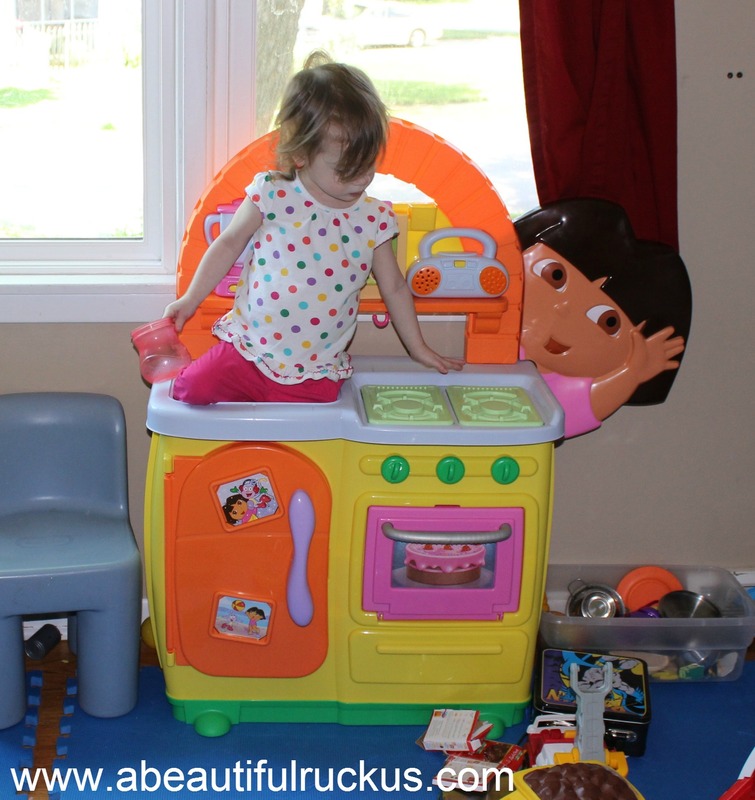 I walked around the corner to find Abby up to her waist in their play kitchen. I don't know the why behind being in there either. Sometimes I just generally don't know with this girl. I always find it fascinating how kids latch onto a toy. Ellie has been playing with her piggy bank this week. 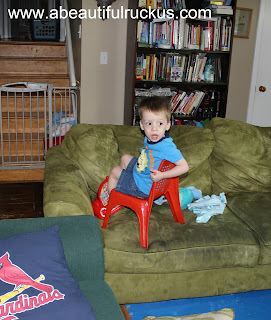 At one point, she moved two chairs to the back door, propped piggy in one, and sat down in the other. I found them when I heard her carrying on a conversation with someone. It's nice to know she has such good friends! I can think of so many ways that this could potentially go wrong. 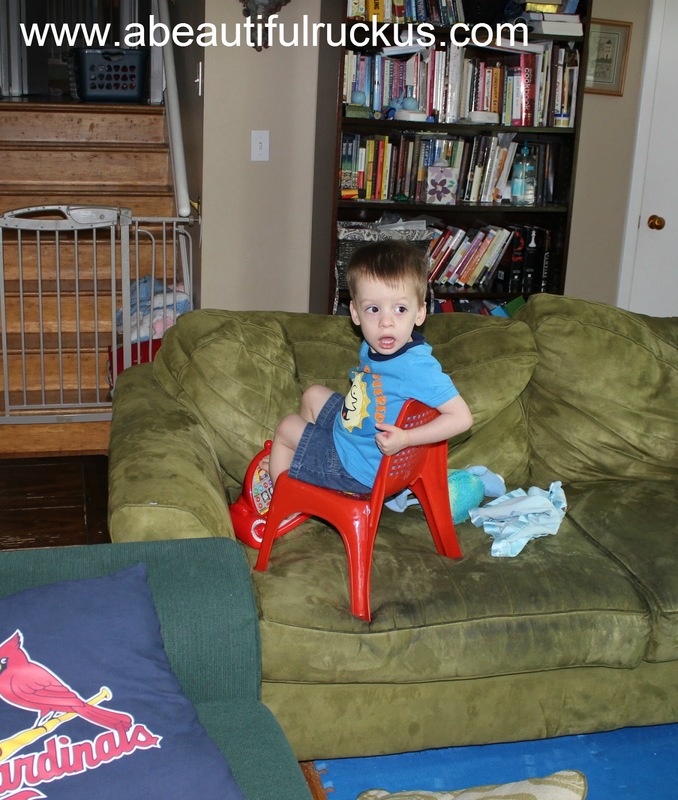 I couldn't help grabbing my camera to snap a photo of Caleb, but you better believe the chair came off of the couch moments after I put my camera down! 5. "Daddy! You Forgot Your Hat!" Aw, this is such a cute story! Daddy had to go out to mow the grass this week. Ellie knows that Daddy always wears his hat when he is doing yard work, but she found his hat sitting on the couch after he went outside. She ran over to the door to the garage and yelled, "Daddy! Daddy! Hat! Hat!" 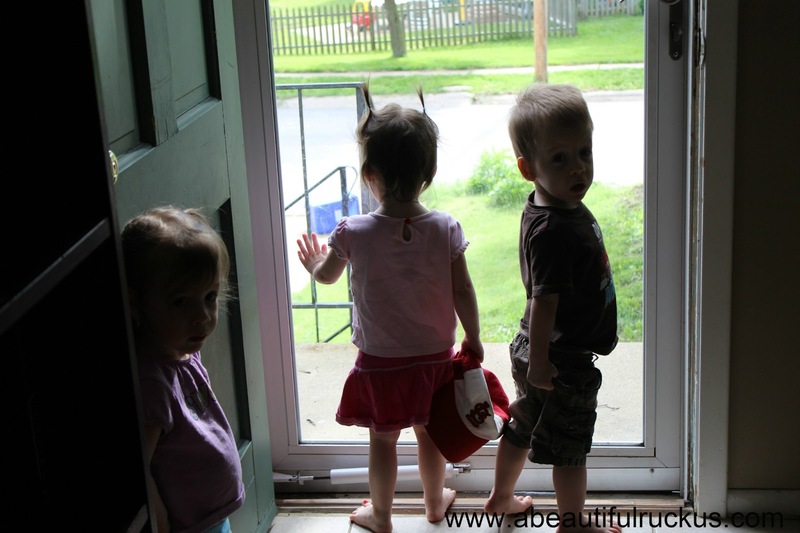 He couldn't hear her, so she turned around and ran to the front door. She patiently stood there and waved his hat at him until she caught his eye. She had the biggest giggle when Daddy opened the front door and thanked her for finding his missing hat. It was so precious to see her eyes light up for being such a big helper! 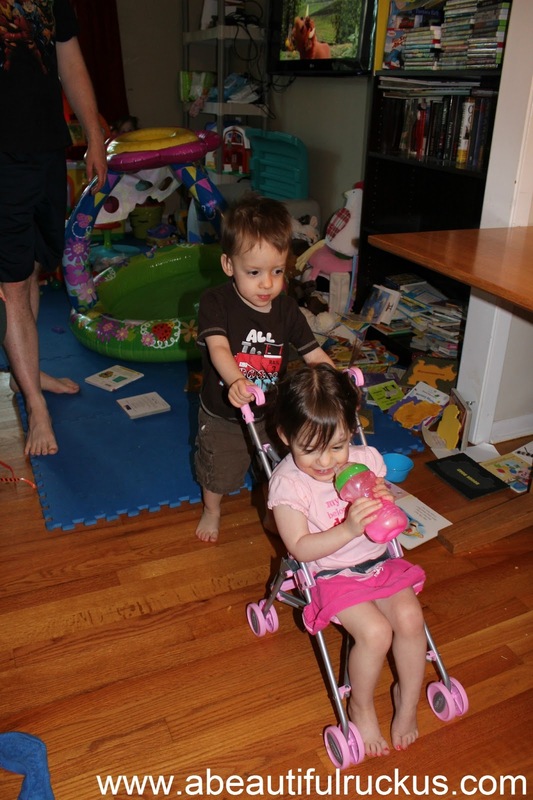 We have these little doll strollers that our preemie kids can fit in. They all like to sit in them, but the boys started giving Ellie's rides this week. So many giggles! Yep, this photo will be on Little Things Thursdays every week until the season is over. I can't help how much I enjoy our fresh produce! This week we had: one dozen pullet eggs, one pound of beef, one bottle of honey (plus an extra one that Sean's coworker gave us! 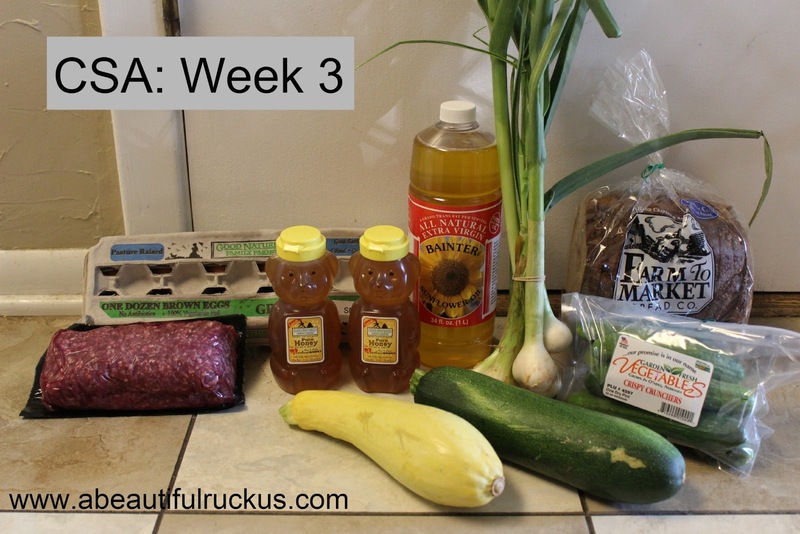 ), one yellow squash, one zucchini, a giant bottle of sunflower oil, a package of mini cucumbers, a loaf of Farm to Market Bread, and a clump of something I'm not sure about....maybe is tiny onions or garlic? They are green onions :)My family grows them in their garden every year. If you cut the bulb off, you can re sprout them with the tops. Or you can shop the tops up & add them to salads. I knew someone would be able to help me out! Thanks for identifying them for me! Okay...I have to start doing this linkup! This is a GREAT idea. I will try to get something together today and party on! I'd love for you to participate in the linkup! I am not sure which is cuter, her trying to give daddy the hat, Abby actually in the kitchen or Ellie with her piggy. Love Ellie and her Piggy! 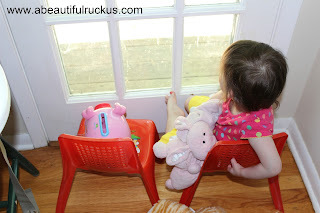 I found her bunnies in her doll stroller looking out the back door before nap time today. She's so silly! My kids LOVE ours! It's one of their favorite toys! Who came up with the hammock idea?